Kom ut våren 2013. Inbunden, 21,6 x 28,7 cm. This beautifully illustrated book vividly depicts the most threatened birds on Earth. It provides up-to-date information from BirdLife International on the threats each species faces, and the measures being taken to save them. Today, 590 bird species are classified as Endangered or Critically Endangered, or now only exist in captivity. This landmark publication features stunning photographs of 515 species–including the results of a prestigious international photographic competition organized specifically for this book. This is the first time that images of many of these birds have been published. It also showcases meticulously accurate illustrations by acclaimed wildlife artist Tomasz Cofta for the 75 species of which no photographs are known to exist. The World’s Rarest Birds has introductory chapters that explain the threats birds face in a rapidly changing world, how their threat status is assessed, and how this information is used to set conservation priorities. The book is divided into seven regional sections–Europe and the Middle East; Africa and Madagascar; Asia; Australasia; Oceanic Islands; North America, Central America, and the Caribbean; and South America. 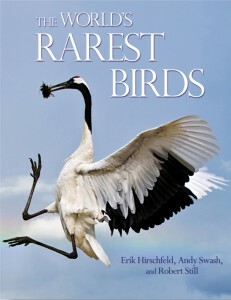 Each section highlights particular conservation challenges and threatened bird hotspots, and includes a comprehensive illustrated directory of the most endangered birds, giving a concise description of their distribution, status, population, key threats, and conservation needs. This one-of-a-kind book also covers the 60 Data Deficient species. QR codes are included for every species, linked directly to the relevant species factsheet on BirdLife International’s website, where detailed, up-to-date information is freely available. Erik Hirschfeld works in air traffic control management and is a freelance writer, guide, and consultant in ornithology. Andy Swash is managing director of WILDGuides and a professional wildlife photographer, naturalist, author, and guide. Robert Still is an ecologist, widely traveled naturalist, and graphic artist who designs books that encourage people to take a greater interest in the natural world.